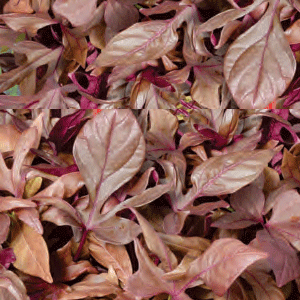 Ipomoea Rusty Red - Brad's Bedding Plants, Inc. Bright Foliage provides a light color for this trailing vine. An excellent foliage contrast in containers, baskets, window boxes or garden beds. Produce small white flowers in warm tropical conditions, but is mainly sold as a foliage plant for accent. Grows 10 to 12 inches tall and 24 to 36 inches wide. Full Sun.